Happy Monday, loves! We hope you had the best Thanksgiving weekend ever. Did you shop for Black Friday? Get beautiful gifts on Small Business Saturday? Looking to save on Cyber Monday? Well, we have good news: the savings fun continues with today’s post on Cyber Monday wedding gifts! We’ve shared the best Black Friday wedding deals (including sales that continue through today) last week, amping you up to save big for your wedding day. And today we’re sharing six Cyber Monday wedding gifts we know you’ll love including a fun stamp for invites, a gorgeous bridal robe, and gifts for your BFFs… maybe even something for yourself. There are dozens upon dozens more awesome by handmade artisans available on Etsy for Cyber Monday, so be sure to check those out, too. Each of these gifts featured below are discounted + on sale but T O D A Y only, so hurry + shop before the deals end. Let us know which wedding gifts you like best in this list. Enjoy! STAMP IT! 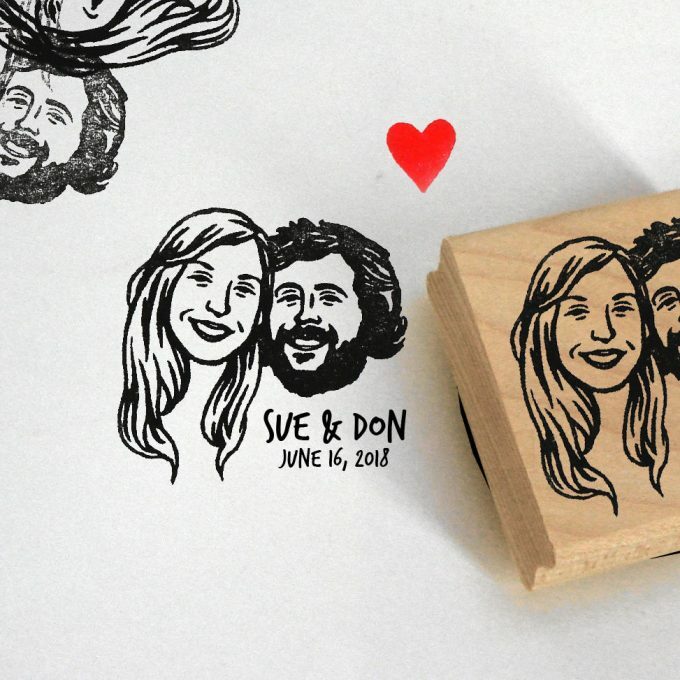 Put your best face forward — literally — with this personalized stamp by LiliMandrill. Put it on your wedding invitations, save the dates, and thank you cards. 20% off today only: shop here! 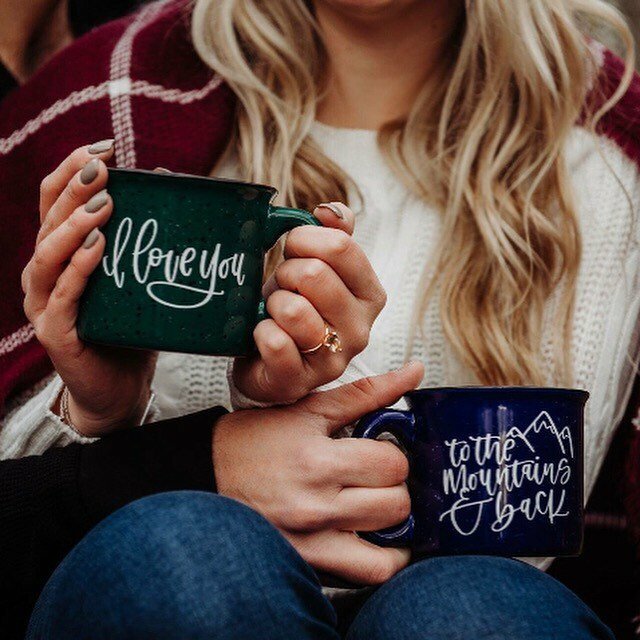 You can have your mug say anything you’d like! 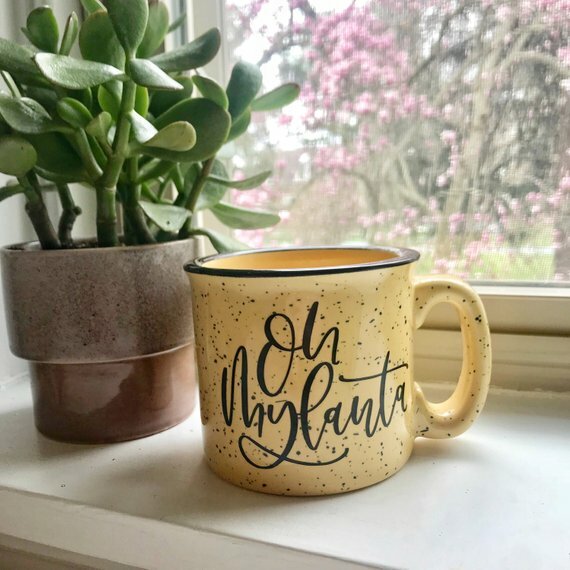 Make your mug for a fan of the TV show F•R•I•E•N•D•S, a super-fan of Fuller House (“Oh, Mylanta!) or any sweet saying of your choice. By Sweet Lou Designs. Stay warm all season long and wear your heart on your hands! Half hearts with initials of your choice combine in the center to form a full heart. By TalkinGloves. 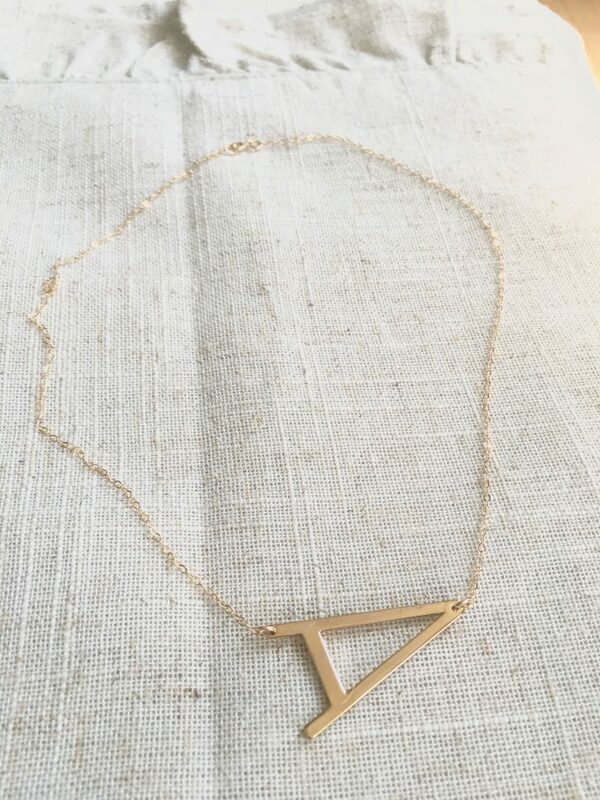 This sweet sideways initial necklace is one of the best-selling gifts of the season. We love the color, size, and price of these! Gift one for every bridesmaid in your ‘crew. By Ava Hope Designs. 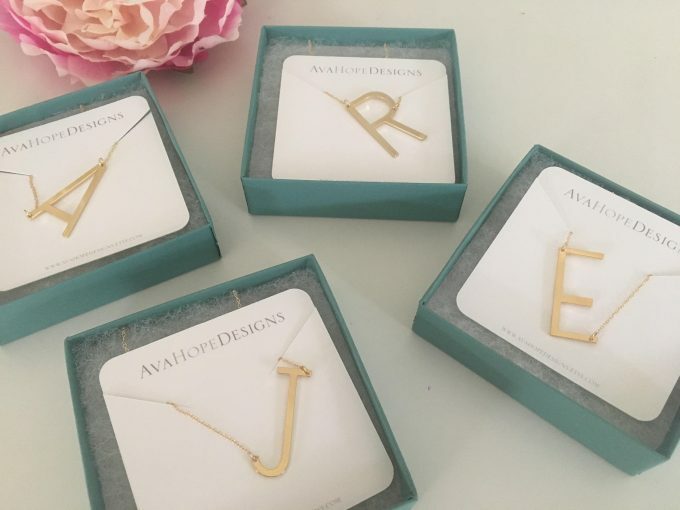 This is another beautiful gift idea for your bridesmaids (or yourself!) 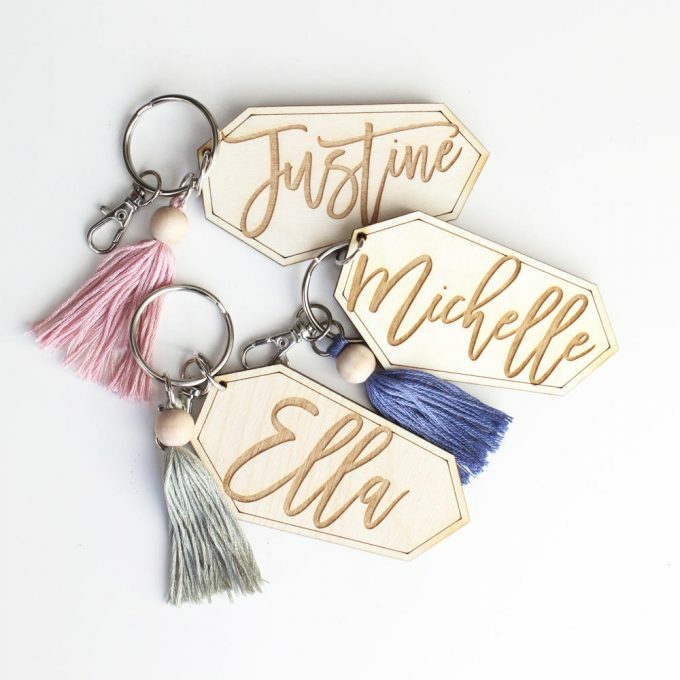 Check out these tassel keychains, engraved and ready for gifting, by Sugar Blush Studio. Save 20% off today only: shop here! And last but not least, this bridal robe is beautiful — and a whopping 40% off today only! Wear it while getting hair and makeup done on your wedding day, while relaxing on your honeymoon, and beyond. By LeRoseGifts. 40% off today only: shop here! Don’t forget to save big on invitations for Cyber Monday! 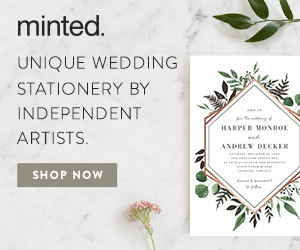 Minted offers beautiful invites and wedding paper goods by independent designers. Save big: 25% off everything plus FREE shipping. Code: CM2018, ends Tue 11/27 at 9 AM PT. Click here to save!